Party Hard is back, and is bringing mass murder back to the dance floor. Will you be returning, or is this party best left unattended? Have you ever found yourself attending a party, and wondering how on earth you got there? The music is terrible, the people are insufferable and the only thing keeping you there is the slim chance that something of mild interest might happen at some point during the night. The original Party Hard was a game that harnessed this seed of a feeling and took it to its least logical, most violent conclusion. Your character just wanted a good night’s sleep, and the only way to achieve those forty winks was to don a hockey mask and brutally murder forty or so party guests at various increasingly lavish parties. 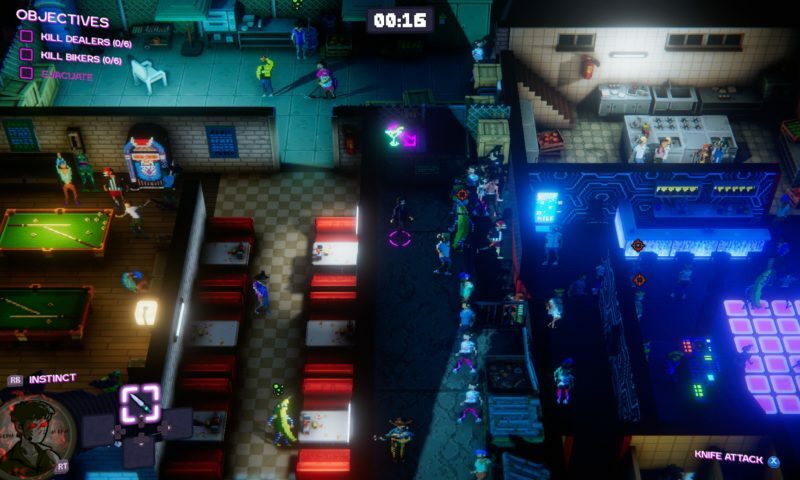 Party Hard 2 relishes in the same pseudo-stealth chaos that made its predecessor novel, and while there are marked improvements to be found in the sequel, Party Hard 2 is still married to a concept that never quite stuck the landing the first time around. Right out of the gate, Pinokl’s sequel does fix one of the original game’s biggest issues: the player is no longer tasked with offing 35 individual part guests. Instead, the objective is to eliminate 5-10 targeted party-goers – everyone else is just collateral damage. This means less time spent rehashing the same schemes before fumbling guest 35, and more time trying to expertly ice the specific targets in question. 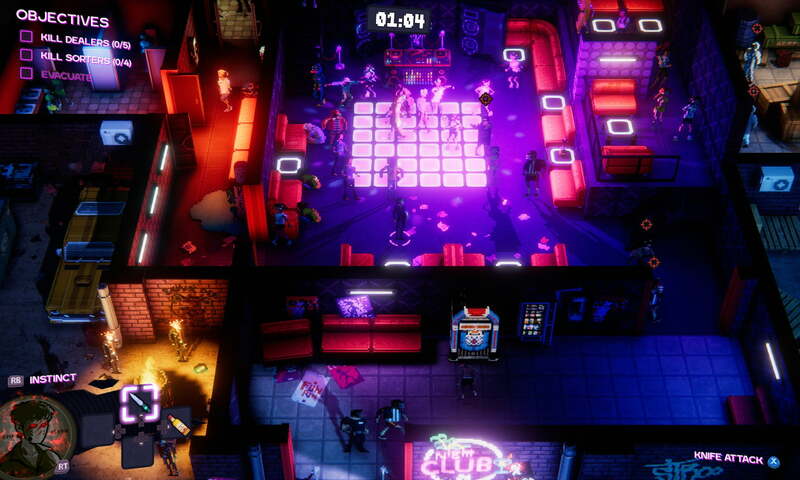 Party Hard was always a blend of Hotline Miami and Hitman, and the sequel undoubtedly takes more cues from the latter, offering up tighter, more focused missions with less of an emphasis on widespread mayhem. Party Hard 2 looks fantastic, and really delivers on the original game’s promise of a slower, more methodical Hotline Miami. However, the three available preview missions don’t offer enough complex killing solutions to make Party Hard the true 2.5-D Hitman rival it has the potential to be. You can knife guests, either out in the open or in secluded spots, ply them with alcohol until they’re barfing up their innards in a dank back alley, light up petrol canisters on crowded dance floors, or sabotage electrical equipment to create explosions. This can result in a lot of waiting around for targets to walk past malfunctioning jukeboxes, or awkwardly following patrons into bathrooms and hoping that everyone else leaves. Your best bet is always to chance Party Hard 2‘s simplistic stealth mechanics, because once you’re spotted there’s pretty much no way of escaping from the fuzz. The original game at least allowed you to hop between shortcuts and equip the odd disguise in order to get out of dodge. The sequel isn’t quite so kind – getting cuffed means game over, but it’s near-impossible to fend off or flee from the cops. There are also security guards stationed at various points, who will throw the player out if they catch you trespassing. These aren’t game-ending encounters, they only serve to gate off specific areas. You can bypass them by creating a distraction or killing the guard in question, and while one would think this might offer up interesting choices, it really highlights the game’s biggest problem. Approaching situations with a ‘guns blazing’ mindset will see you instantly arrested, while attempting stealth is frankly rather tedious, and isn’t expansive enough to create interesting encounters or close calls. Party Hard 2’s hospital level is a step in the right direction. There are plenty of opportunities and means to dispose of guests, but the size of the map means things can start to drag. It doesn’t help that audiovisual feedback is somewhat underwhelming. Party Hard 2‘s neon pixel art has received some noticeable upgrades, particularly in terms of lighting and the transition from 2-D sprites to 3-D objects, but it can still be difficult to determine exactly what is going on at any given time. Whether or not the player is hidden is communicated via a peculiarly small ‘eye’ icon in the bottom left-hand corner, which means taking your own eyes off potential victims for just long enough that they might be able to escape. This could have been communicated better, as could other environmental factors. I mentioned that dropping a petrol canister in the middle of crowded room can be a fast and efficient way of offing multiple targets, but there were several instances where I couldn’t see whether or not I had successfully lit the canister. It turns out I most definitely had, and had also succeeded in blowing myself up in the process. There were even a couple of times where I was arrested for seemingly no reason – I hadn’t killed anyone yet, so presumably somebody had just seen me rummaging around with an easily destructible set of speakers. Again, this wasn’t communicated very well. Question marks appear over guests’ heads, but it isn’t always clear as to why. Am I trespassing? Have they seen me doing something I wasn’t supposed to? Are they special enemies included in the mission who recognise the player? These are all distinct possibilities, and once again, they’re generally impossible to escape without stabbing more people, thus generating more heat. 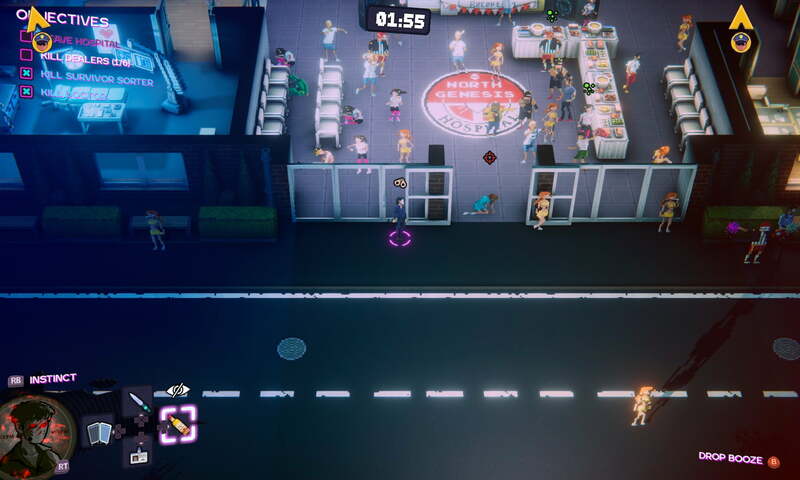 The game’s environments can get a little too busy at times, and it’s generally difficult to use large crowds to your advantage. Party Hard 2 is still strong conceptually, as was its predecessor. But like the original, this go-around suffers from balancing issues and an overall lack of depth. Like a great party, this stealth-murder hybrid should be a playground, a chance to have fun with creative kills and experiment with different gameplay styles. Instead, it still feels like the only viable option is to wing it, and hope that you can somehow outsmart the game’s unpredictable AI. So far, Party Hard 2‘s gameplay doesn’t match its extravagant style. It’s a part worth checking out, but you might not want to stick around for too long.